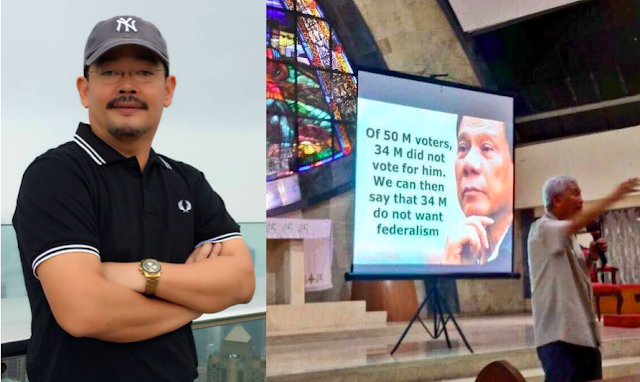 Prominent blogger Carlo de Leon addresses Manila Auxiliary Bishop Broderick Pabillo on the latter’s statement that the 34 million people who did not vote for President Rodrigo Duterte also necessarily does not like federalism. 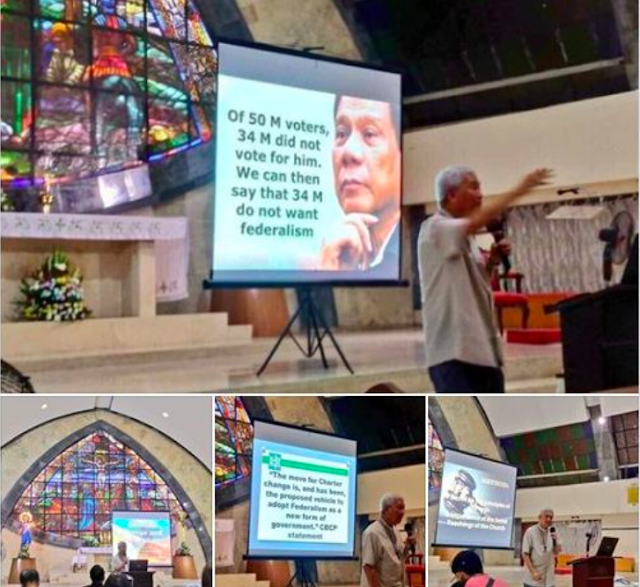 Recently, pictures of Bishop Pabillo went viral on social media while discussing Federalism and saying that there's a lot of people who are not supporting Duterte. Based on his logic of the 50 million voters, 34 million did not vote for him, which means 34 million do not want Federalism. De Leon says that Bishop Pabillo committed false dichotomy. He says that the 34 million people who did not vote for Duterte does not automatically equate to having 34 million people who do not want federalism. He says that the same logic can also be applied to the voters of Vice President Leonor “Leni” Robredo. De Leon says that among the 50 million people who voted, 36 million did not vote for Robredo. And that this 36 million people can also be for federalism because they are against Robredo. More than that, De Leon says that most of Filipinos do not understand what federalism even means. He says that it is because of this that Filipinos cannot even make a valid judgement. Just like most people, De Leon implores the clergy and other religious leaders to stay out of politics. He adds that these people should only do what they do best: pray that the problems of the country may be solved. He then uses some quotes from other religious leaders in order to implore Pabillo. Quoting St. Pope john Paul II, he says that priests are not social or political leaders. Seeming to hint that what makes a good Catholic is one who seeks obedience towards the Pope. 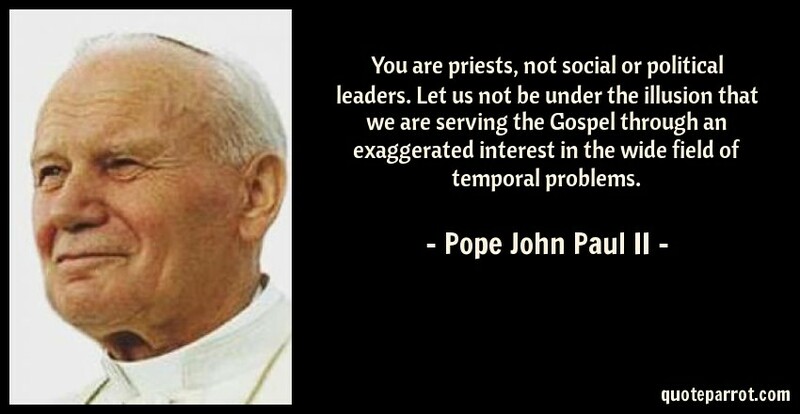 "You are priests, not social or political leaders. Let us not be under the illusion that we are serving the Gospel through an exaggerated interest in the wide field of temporal problems." — St. Pope John Paul II. Sorry Bishop Pabillo, your logic is flawed. Yes, 34 Million people didn’t vote for Duterte. But it doesn’t mean 34 Million do not want Federalism. An appeal to possibility is a logical fallacy. Your logic can also fall under the false dichotomy fallacy. Those who didn’t vote for Duterte doesn’t mean they are against Federalism. Here’s the thing...if you apply the same logic to the number of people who did not vote for Leni, that means 36 Million do not want Leni to lead the country. She only got 14 Million votes out of 50 Million. Here’s another thing...a vast majority of Filipinos don’t understand what Federalism means. How then can Filipinos make a valid judgment? Here’s the last thing...with all due respect and obedience to the Bishop of my faith, I implore you and the rest of the clergy to stay out of politics. Prayer is still the best solution to help us with our problems. May I also remind you Pope Francis said, "'A good Catholic doesn't meddle in politics.' That's not true. That is not a good path. A good Catholic meddles in politics, offering the best of himself - so that those who govern can govern. But what is the best that we can offer to those who govern? PRAYER!" Obedience to the Pope is a virtue of a humble and good Catholic. I will continue to pray hard for the leaders of this nation, the leaders of the Catholic Church and their flock, and for all Filipinos.